Isn't this cute? 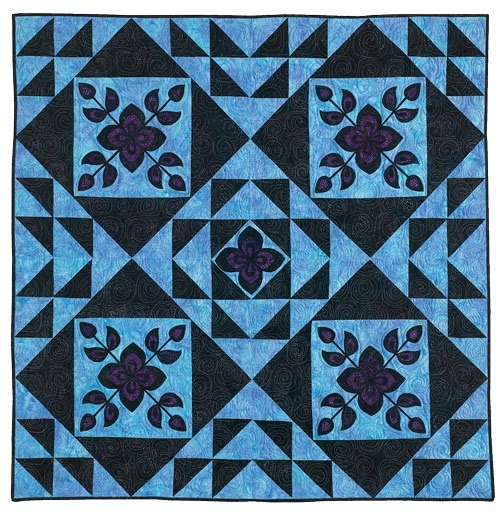 It's block #597 from Quiltmaker's 100 Blocks, Volume 6. Block design by Denise Starck. This block has a LOT of little pieces. 68, if I counted correctly. I was concerned about keeping them all straight without marking each one. 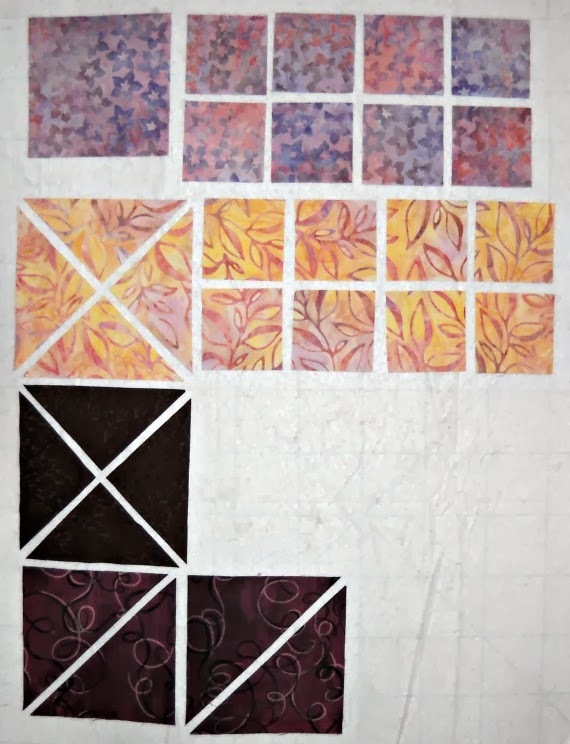 I solved this problem by cutting out some of the pieces, and sticking them to my design wall, in the same order as the cutting instructions in the magazine. 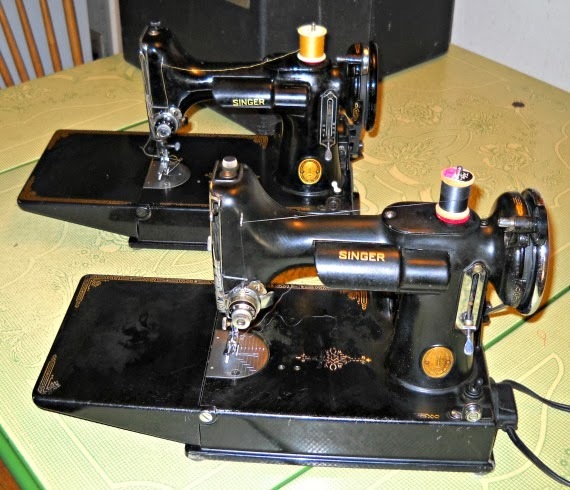 Next, I sewed some of the units together. Here you can see the ladder with the little bucket on the end. 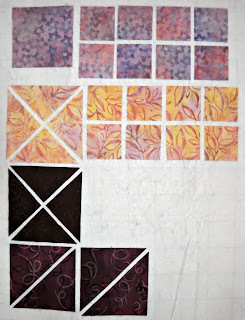 At this point, I stopped sewing and cut out the remaining pieces, again sticking them to the design wall in order. It's starting to look like a real fire truck! See how it goes with the Mixmaster? They are both designed by Denise Starck. 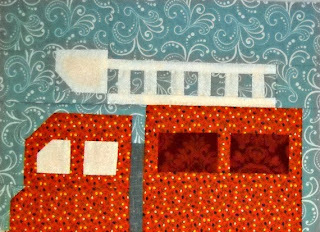 I'm sure I'll be sewing the School Bus block, too. Until next time...please visit the Curlicue Creations Shop...and have a Happy Thanksgiving day! Giving Thanks Blog Hop Winner! 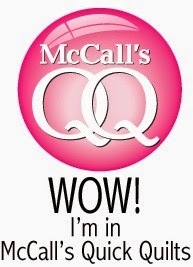 A great big congratulations to Barbara Woods of Summerville,Georgia! 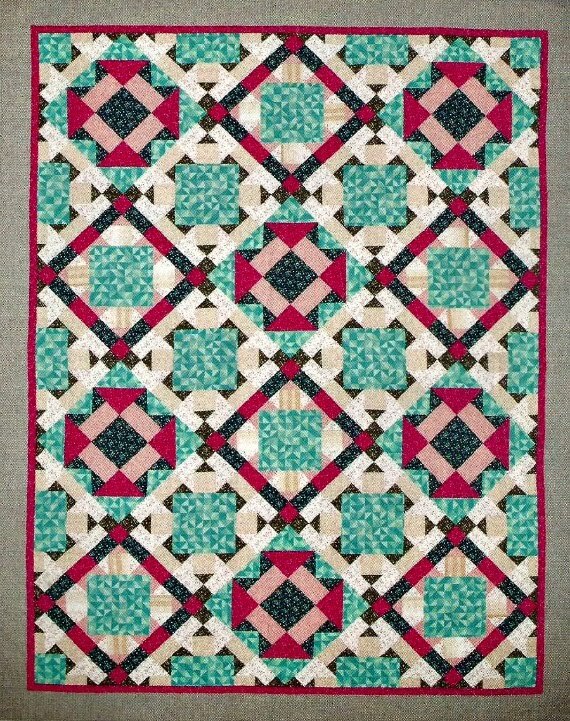 She was selected by random number generator as the winner of this lovely issue of Quiltmaker's 100 Blocks, Volume 8. I'll get that out to you soon, Barbara! Thank you, everyone for your captivating comments! It was delightful reading and appreciating what you are thankful for. It also made me think about all of the people and things in my life that I am thankful for. The fourth block Trent selected for his quilt is "Snow Day". 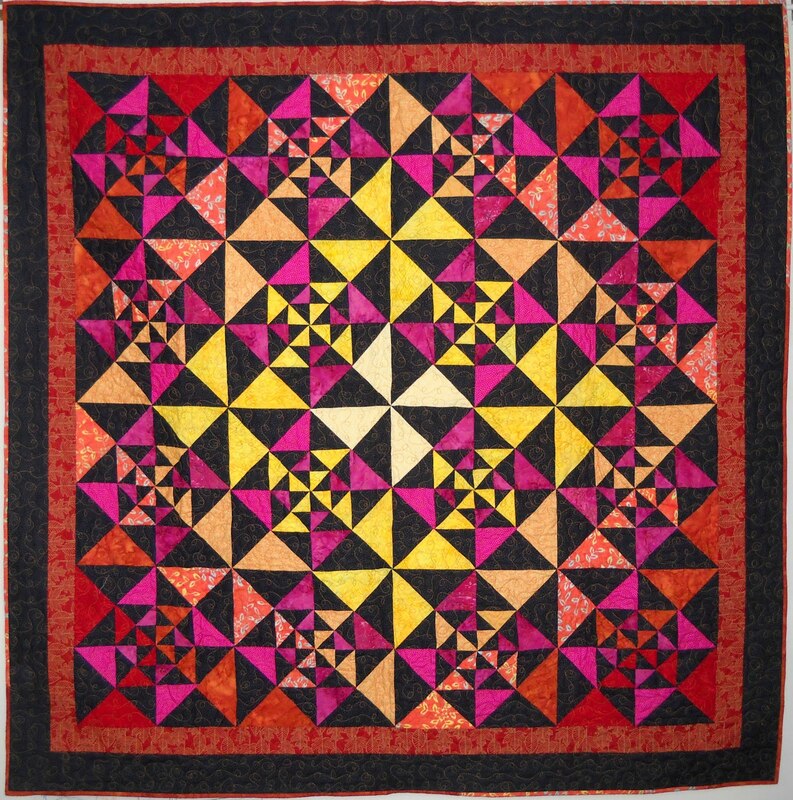 "Snow Day" is block #509, from Quiltmaker's 100 Blocks, Volume 6. 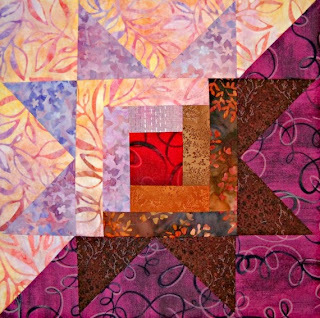 Block design by Denise Russart. Before embroidering the sled's rope, it looks like a big rock rolling down the hill! 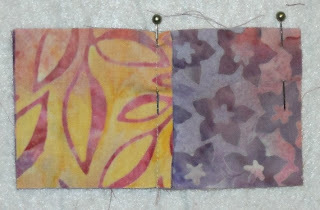 A close up of the zig-zag stitching around the trees. Here's the finished block. On to the next one! My 3 year old son, Trent just loves to look at the Quiltmaker's 100 Blocks magazines and pick out the blocks he wants me to sew for him. I finally got around to sewing a few blocks for him when issue #8 came out. I'm making him a special quilt with his favorite blocks. Here's what I've sewn so far. Mixmaster, Block #797, from issue #8. 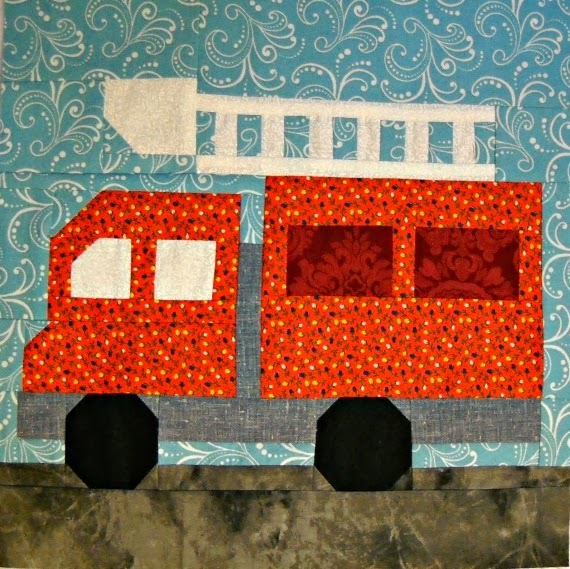 Block design by Denise Starck. Rollin' Along, Block #717, from issue #8. 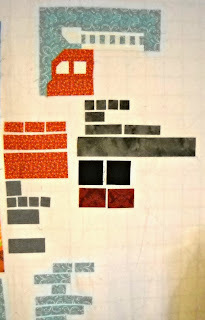 Block design by Kristy Wolf. 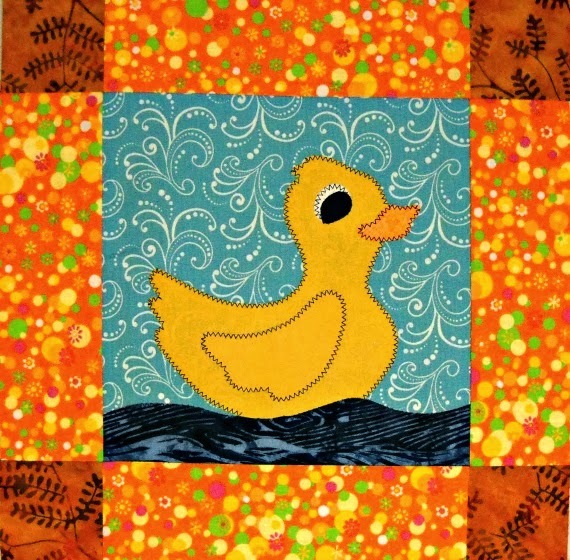 Rubber Duckie, Block #246, from issue #3. 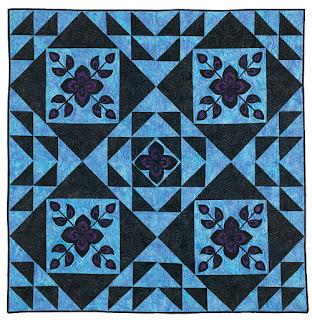 Block design by Heidi Pridemore. 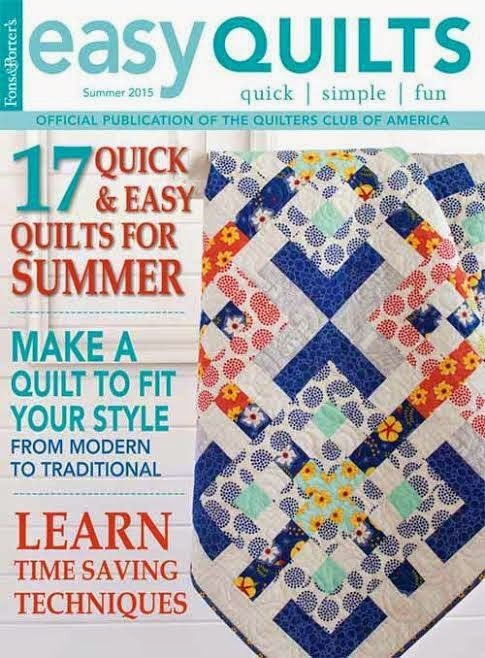 The latest issue of Quiltmaker's 100 Blocks, Volume 8 is on sale now. 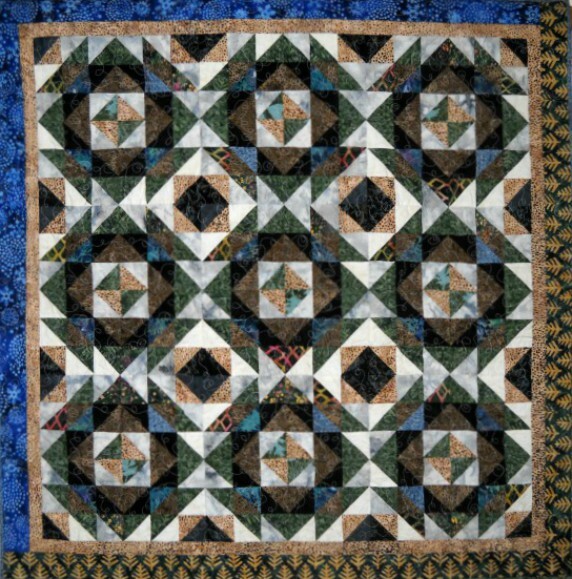 I have a few copies available in the Curlicue Creations online shop, here: Quiltmaker's 100 Blocks, Volume 8. 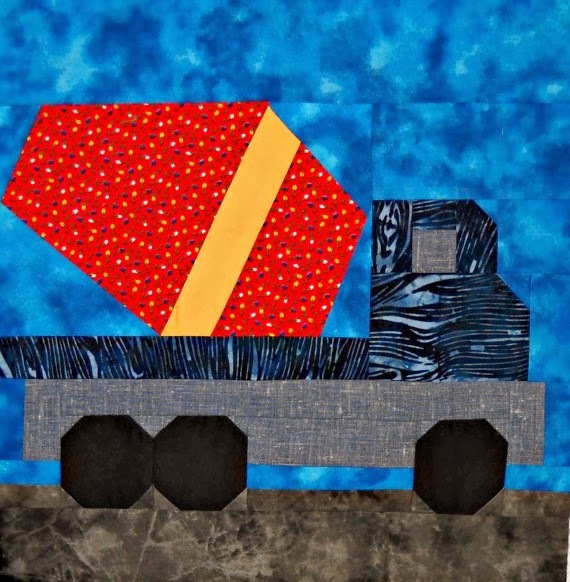 Giving Thanks with the Quilting Gallery Blog Hop! Hello! 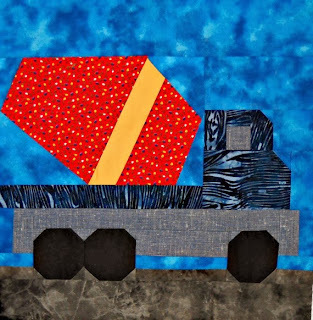 Welcome to my little segment of the Quilting Gallery Giving Thanks blog hop. If you're a regular reader of my blog - thanks so much! I'm thankful for all of you, your terrific comments, and suggestions. You make me smile. If this is your first time visiting Curlicue Creations, welcome! Here's a sampling of what I write about on my blog: One of the subjects I write about is my ever growing vintage sewing collection, like my 1937 and 1951 featherweights (shown above), my iron collection, and other sewing nostalgia I come across in my vintage shopping forays. 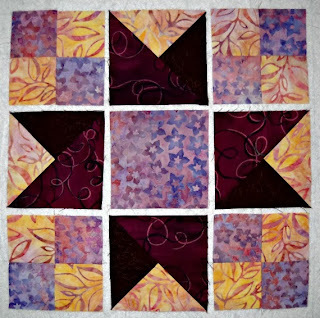 We are also in the middle of a Star Block of the Month tutorial series. 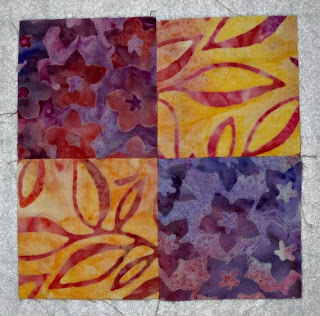 Shadow Star block shown above. To see all the tutorials, click on the Star Block of the Month Tutorials tab at the top of this page. 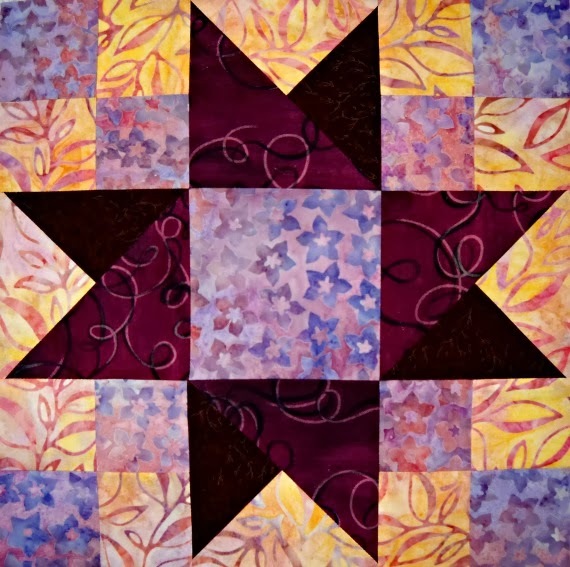 Join me on December 1st for the next block, Flying Star. 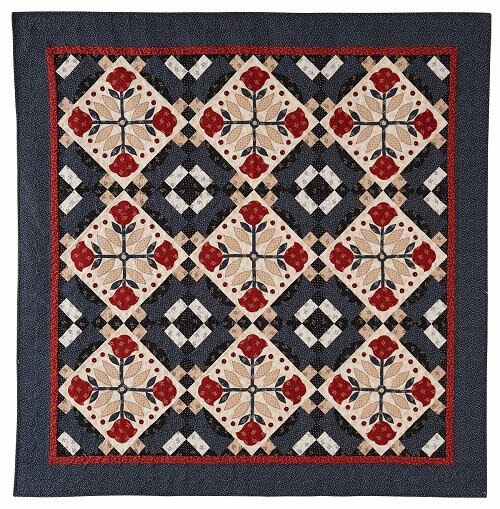 I'm a quilt pattern designer. 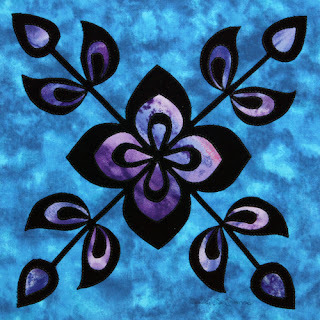 I sell my patterns in my online shop, Curlicue Creations. 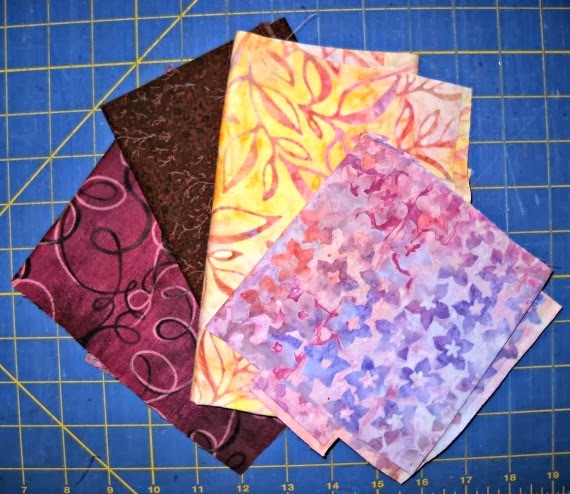 Get the inside scoop about new patterns here first. 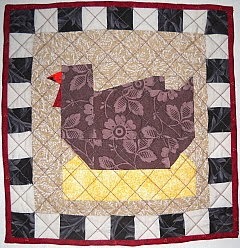 Chickens in the Kitchen Quilted Trivet, shown above. 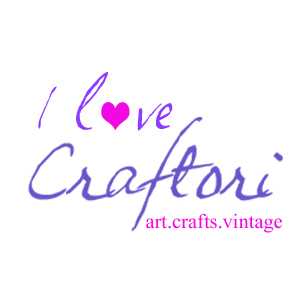 I'm currently running a special in the shop, ten percent off any purchase of $10.00 or more with coupon code HOLIDAY13 at the checkout. 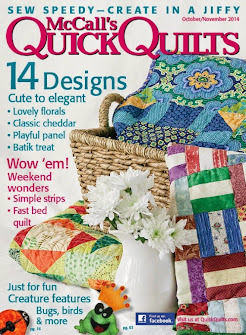 I also do quilt designs for magazines. 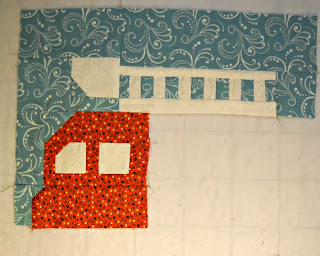 Above is my most recent, Shadow Play, block #713 from Quiltmaker's 100 Blocks, Volume 8. Which brings me to my giveaway! 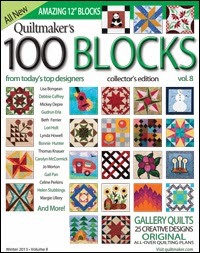 I'll be giving away one copy of Quiltmaker's 100 Blocks, Volume 8. 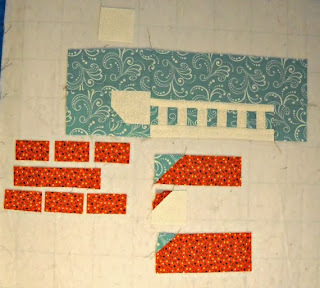 I love this issue so much that I'm already busy, sewing some of the blocks by other designers. Each block is so unique - there is truly something for everyone. To win a copy, I'd like to know what you are thankful for in your life. Just leave me a comment below, and I'll choose a winner at random after the blog hop. 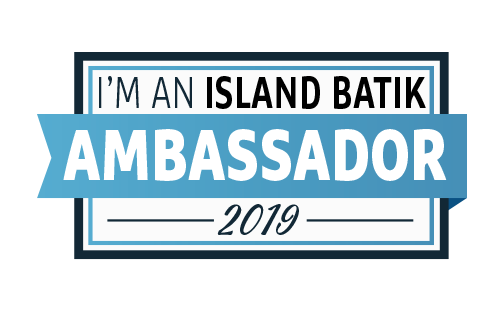 Comments will be open through November 26th and I know I have readers from all over the world, so yes, everyone is welcome to enter. Please be sure I have a way to contact you. 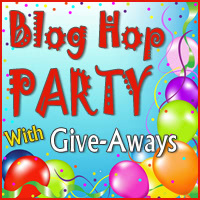 Click the above icon to return to the Blog Hop Party! Every week Trent and I go to the public library for story time. We usually look at the new books, do a few puzzles, sing a few songs and listen to a few stories. Ms. Patti & Ms. Barbara, the children's librarians, are wonderful! 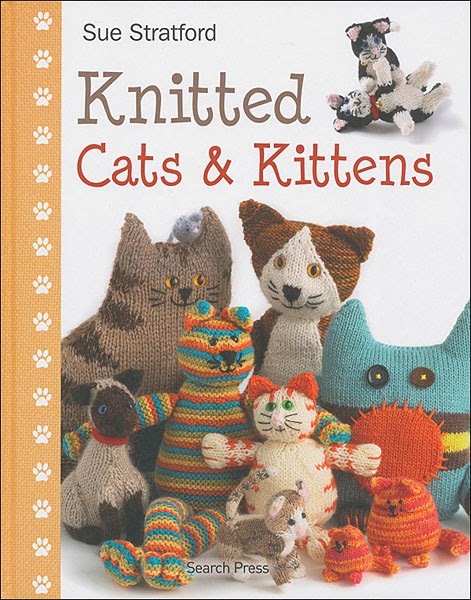 Recently, Trent spied "Knitted Cats and Kittens" by Sue Stratford in the new section. He began his campaign to convince me to check out this book and make a "knitty kitty" (his title for the book). I was in the middle of two quilting deadline projects, but he campaigned hard for the "knitty kitties", and a few days after the quilting finishes we checked out the knitting book. 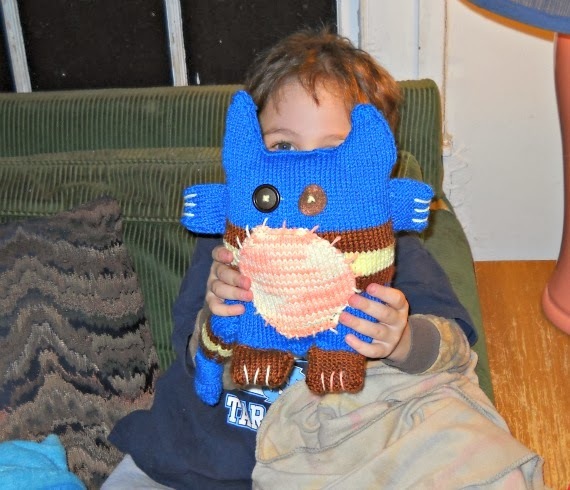 Fortunately for me, he chose the "Monster Cat". I'm not a very accomplished knitter, so I was thrilled to see the easy, straightforward directions. It's mainly stockinette stitch - Yay! Plus, it's a "monster", so it's not supposed to be perfect either. Isn't he cute, peeking over the top of his kitty? Monster Cat seems to have a Jekyll and Hyde personality. One minute he's purring and all lovey-dovey, the next he's jumping and meowing crazy all over you. Trent loves him. Of course, this week I'm knitting a "Monster Cat" for Levi. He wants one, too. A green one, because, as he put it, "Monsters are green." And the winner is.........Dorothy H! Congratulations, Dorothy. 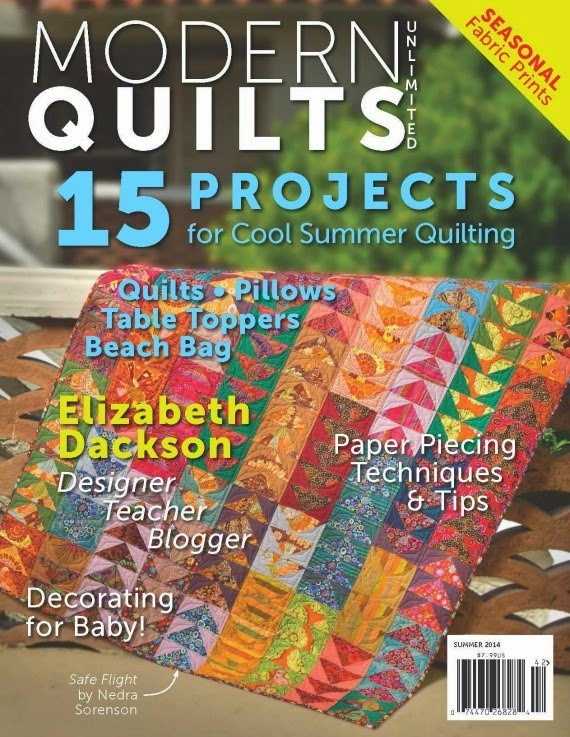 I know you're going to love receiving your issue of Quiltmaker's 100 Blocks, Volume 8. Dorothy was selected by a random number generator. I thought her dessert comment was unique and healthy. She wrote: my favorite is RAW food... so what I am eating now.. yes.. at the computer, is called Zucchini breakfast bar. Using raw zucchini, nuts, and more! Love your site! Thanks to everyone who left a comment. All the desserts made me hungry. I had to do some baking myself. I made some marble cheesecake brownies with holiday chips. Some of the most popular desserts were apple pie, lemon meringue pie, and anything chocolate - Yum! A few readers even gave out directions of how to make their favorite dessert. Lori writes: congrats on being published. What a gorgeous block. And the colors make it stunning. Thanks for the give a way and for sharing. My favorite dessert is Cherry Carnival. Make a cake with cherries inside. Use the canned juice and make a warm cherry topping. Drip the topping over the cake and scrumptious. Supper yummy. 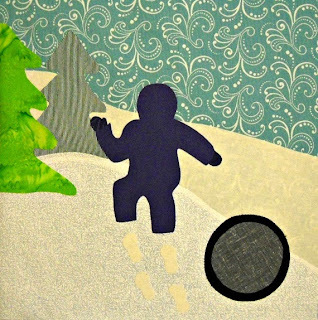 Leanne Parsons writes: Wow! Those fabrics really look like they're glowing! My favourite dessert is Apple Wrapper Pie...it's like regular apple pie, but there's only one crust and it's baked on a cookie sheet, with the edges of the crust wrapped over the apple filling. The crust gets crunchy and oh, so good! 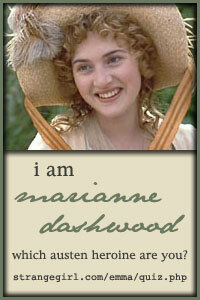 Rachell writes: so stylish and flourished! my favorite dessert of late is Pillsbury Sopapilla Cheesecake Bars. so simple and yummy! spread a can of crescent rolls in a 9x13 pan. blend 2 8-oz pkgs of cream cheese with 1 cup sugar and 1 tsp vanilla, and spread on top of crescent roll base. unroll one more can if crescent rolls and lay on top, pinching seams to seal perforations. brush with melted butter. mix 1/2 cup sugar and 2 tsps cinnamon. sprinkle as much cinnamon sugar over the top as you want. bake for 30 min. cool and cut into bars and serve still warm. You won't be able to stop eating them! 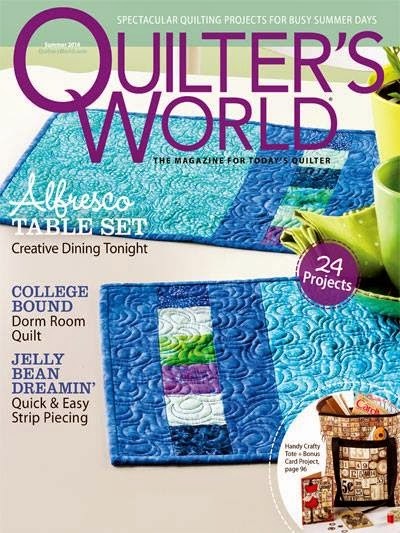 Just a reminder, Quiltmaker's 100 Blocks, Volume 8 will be in stores on Tuesday, November 19th. If you can't find a copy locally, I will be selling a few copies in my online shop, Curlicue Creations. Hello! 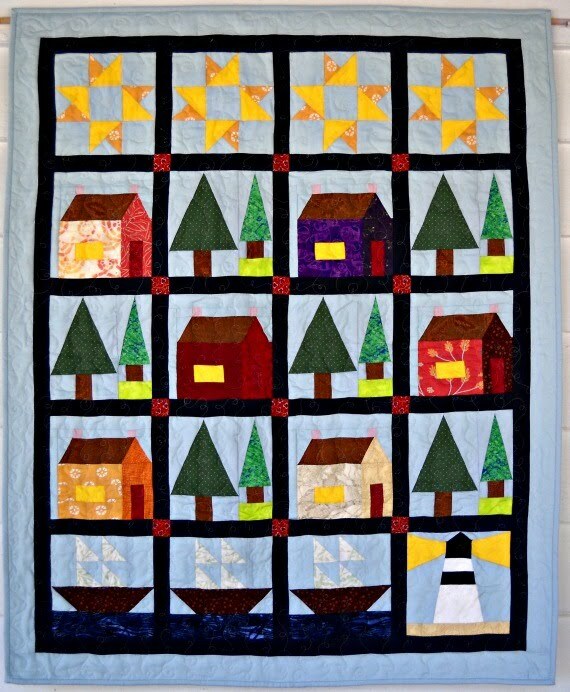 Welcome to my little segment of Quiltmaker's 100 Blocks Blog Tour. 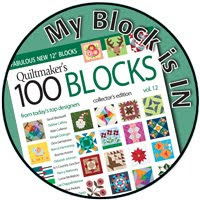 I'm so excited to be a part of yet another one of these fun blog tours and honored to have another block featured in Quiltmaker's 100 Blocks. Here's my block, Shadow Play. It's block #714 in the magazine. It was a lot of fun to sew and I just love the way it glows. 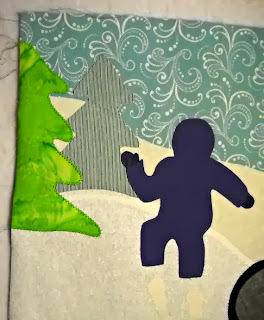 You can change the mood of this block easily by using different colors in place of the blue and purple fabrics. I also sewed this simple, but dramatic wall hanging using four of my blocks, plus a motif from the block featured in the center of the quilt. 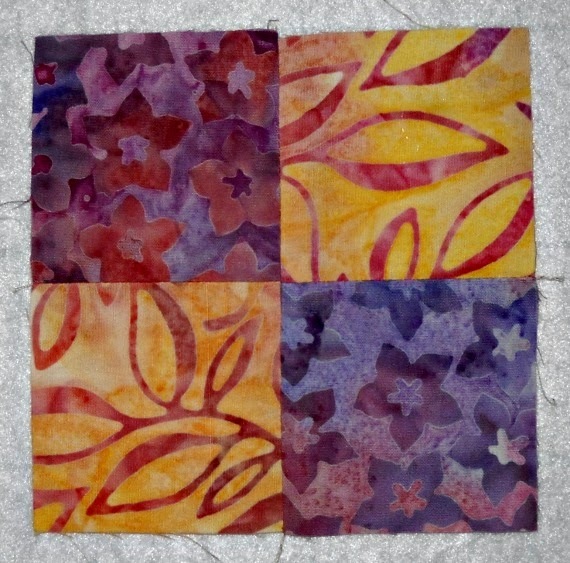 I used three devastatingly beautiful fabrics from Island Batik for my quilt. They really make it sparkle. 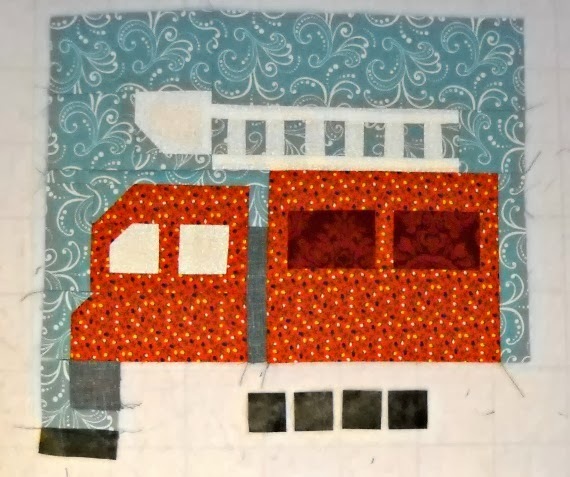 I put together this short slide show of the making of my quilt. I crammed it all into 1 minute, 22 seconds! Much faster than the actual sewing time. Please take a look. Thanks so much for reading and watching. Now for the giveaway....and a little bit of fun. Please leave a comment letting me know what your favorite dessert is. Make me hungry! I'll pick a winner at random at the end of the blog tour. Please be sure I have a way to contact you. 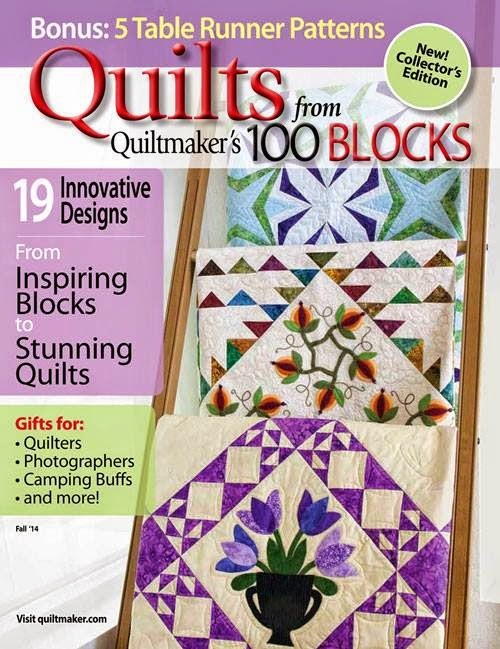 The winner will receive one copy of Quiltmaker's 100 Blocks, Volume 8 - Awesome! 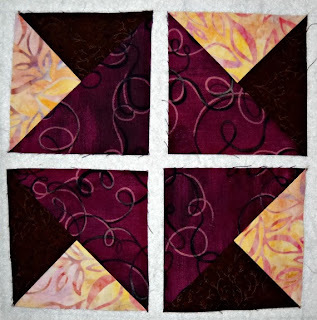 Here's a link back to the blog tour: Quilty Pleasures Blog. 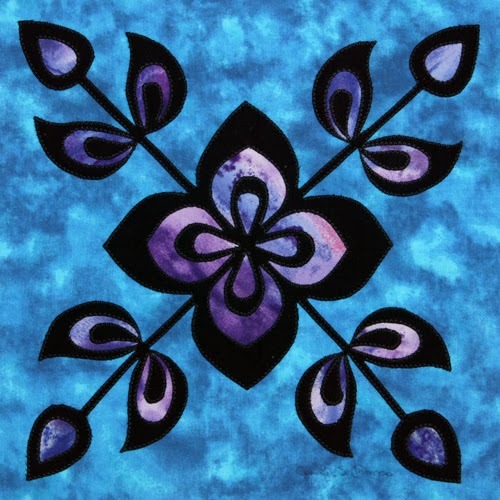 Be sure to visit all the other designers' blogs and see what they are up to today! I'll be there too! 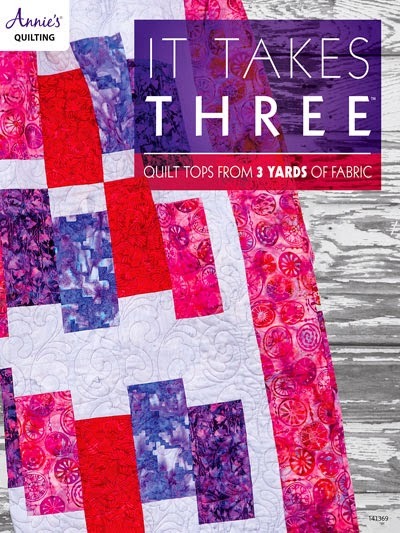 Join Me Tomorrow for Quiltmaker's Blog Tour! 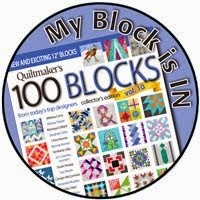 I hope you've been following Quiltmaker's 100 Blocks, Volume 8 Blog Tour this week! The fun started on Monday, with lots of giveaways and quilting fun and inspiration at each quilter's blog. Be sure to check back with me tomorrow for my day. 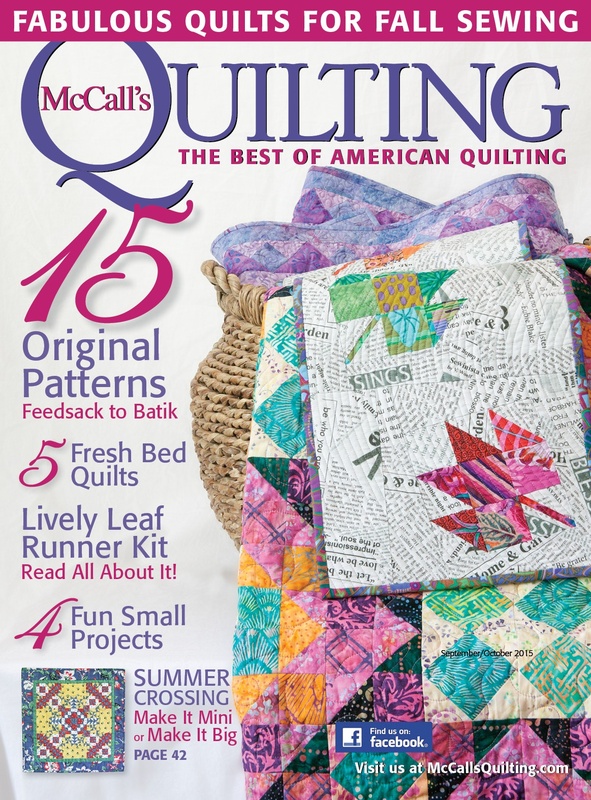 I'll be revealing my block for issue 8, plus a quilt I made, and of course, a giveaway! 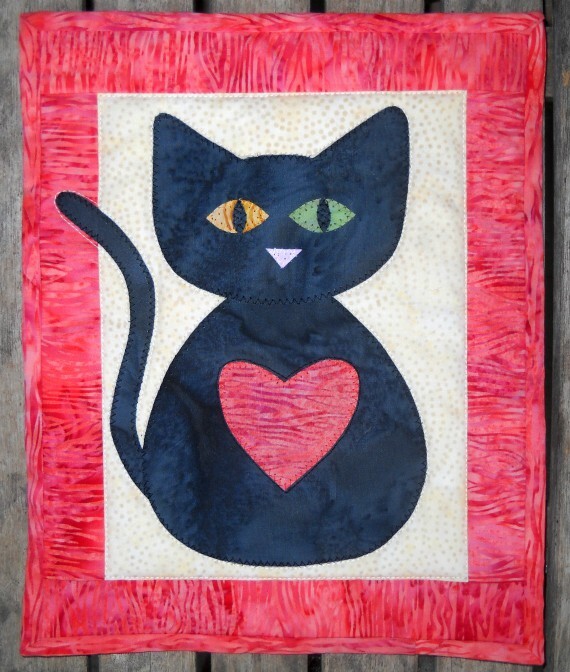 If you need to catch up for the last two days, here's a link to Quiltmaker's blog, Quilty Pleasures. Have fun & see you tomorrow! Hello! 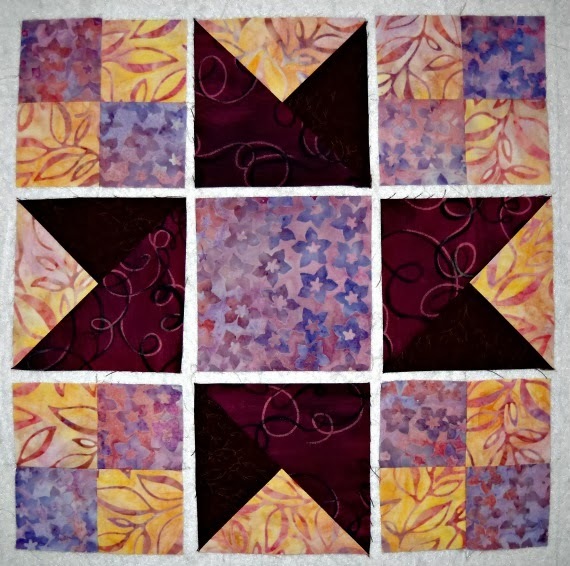 Welcome to November's Star Block of the Month tutorial. This month we'll be sewing Shooting Star. I've posted a tab at the top of my blog where you can view all of the Star Block of the Month tutorials for easy reference. 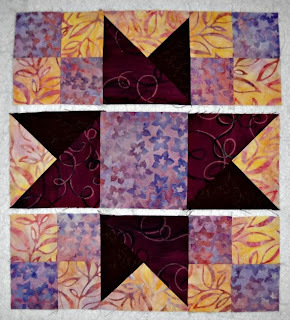 Please note that all blocks finish at 12" square, and we will be stitching with 1/4" seam allowances. 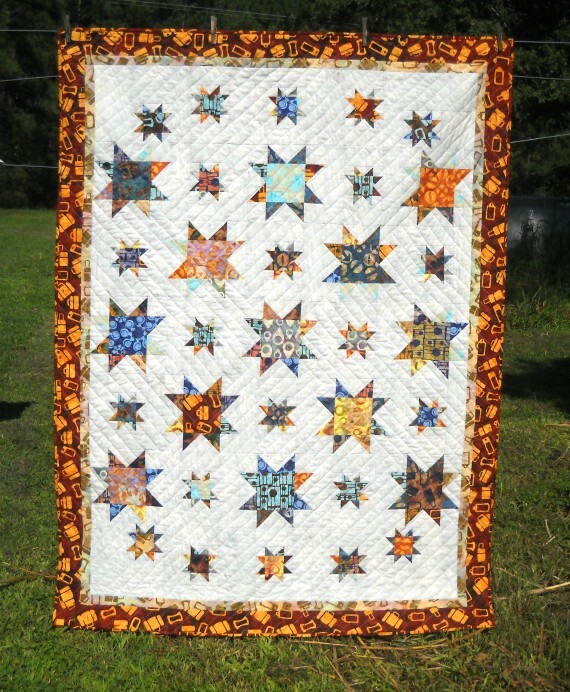 Here's what we'll be stitching today - Shooting Star! 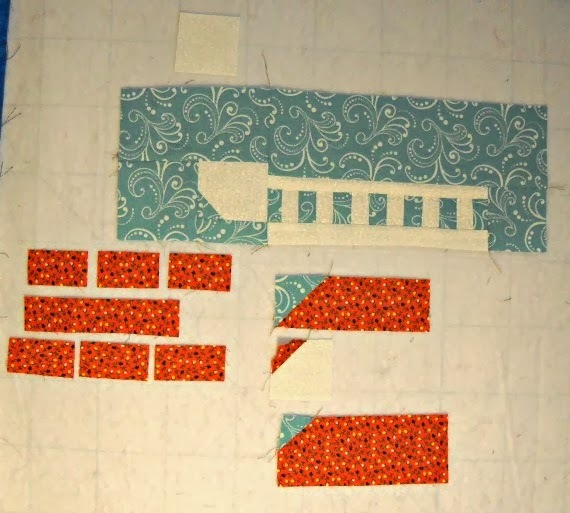 For this block, you will need four fabrics. 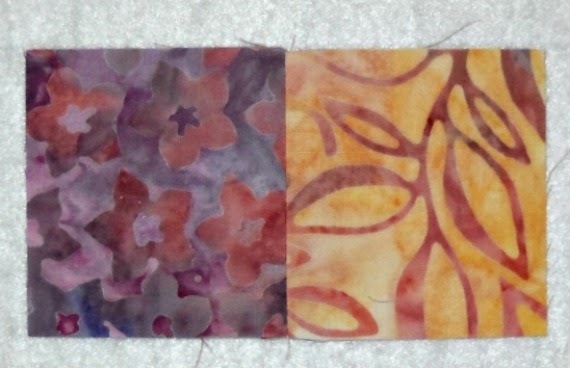 I used purple, light pink, dark brown, and dark purple. These fabrics are by Robert Kaufman - simply gorgeous! 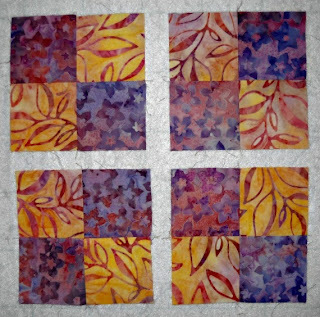 Step 1: Sew 1 each Purple 2-1/2" square A to 1 each Light Pink 2-1/2" square A. Repeat. 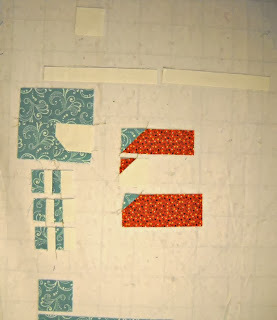 Sew these two units together to make a four patch. I thought this would be a good place to talk about pinning for accuracy. There are a lot of different ways to pin. This is how I do it, because it works for me. 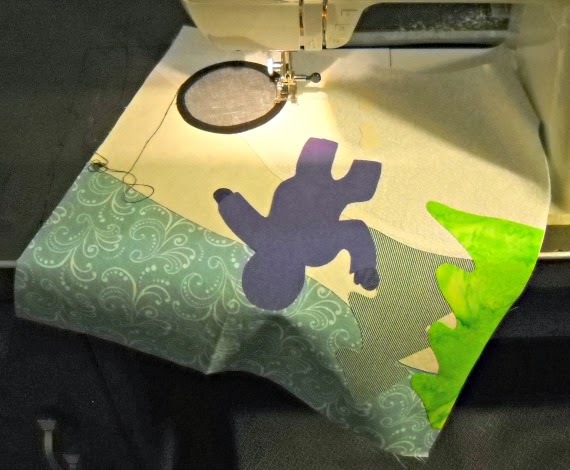 I insert one pin through the seam, with the seams butted, and making sure it is going through the seam on the back side, too. Then I add a second pin to the end of the stitching line to help keep the block together. 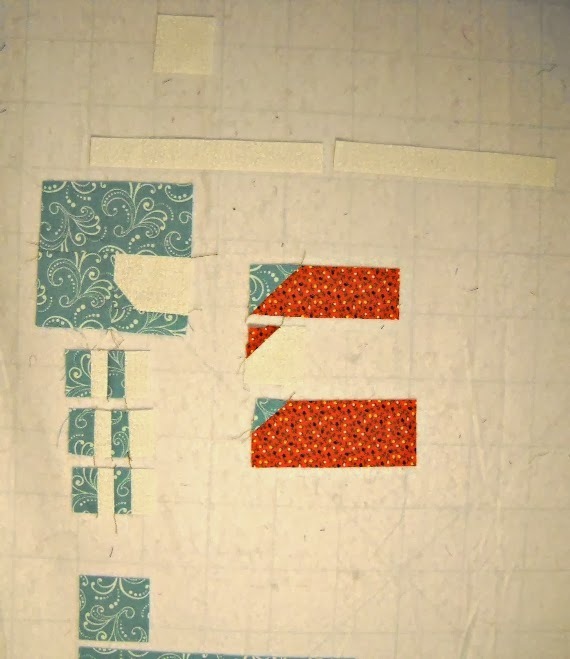 The four patch should measure 4-1/2" square. 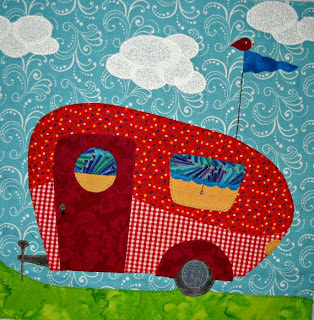 Sew a total of four ea. four patch units. Step 2: Sew 1 ea. Light Pink quarter square triangle B to 1 ea. Dark Brown quarter square triangle B. 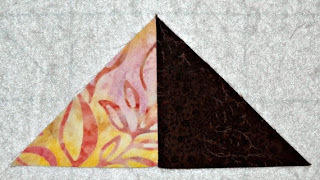 The Light Pink triangle should be on the left; the Dark Brown triangle should be on the right. Sew the triangle unit to 1 ea. 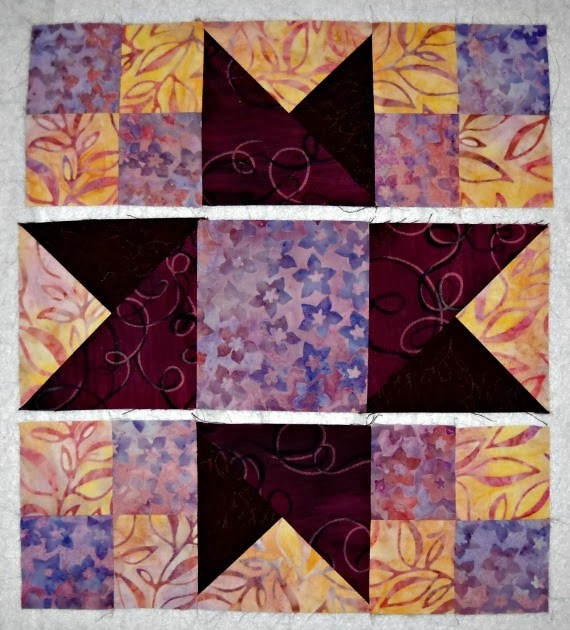 Dark Purple half square triangle D to make a triple triangle square unit. This unit should measure 4-1/2". 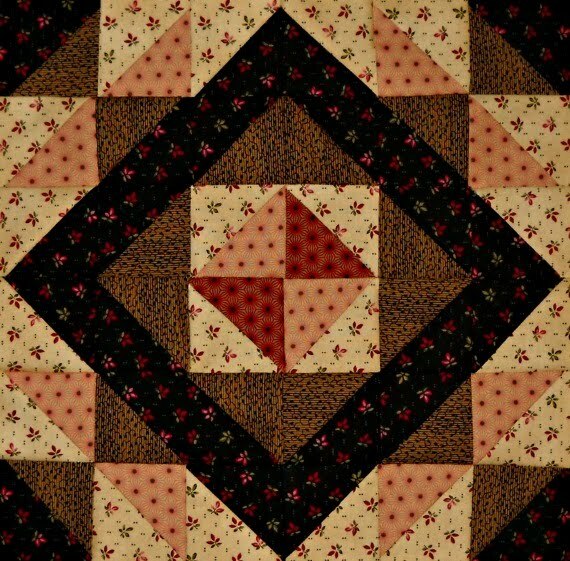 Sew a total of four triple triangle square units. 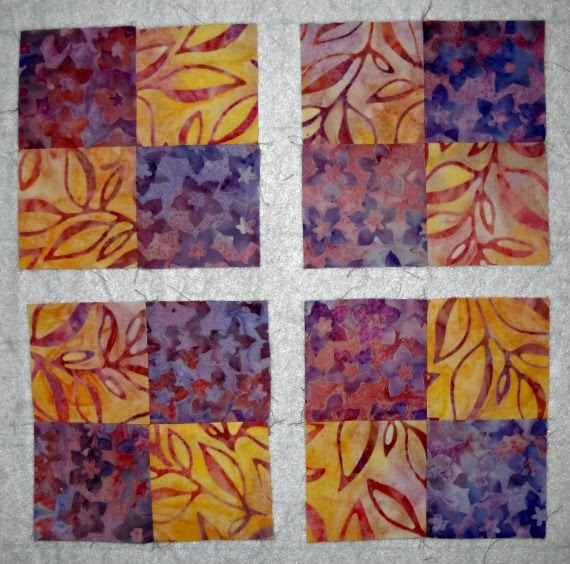 Step 3: Lay out the block, being careful to orient the four patch units with the Purple squares in the outer corners of the block. Make sure the points of the triple triangle square units are on the outside edges of the block. 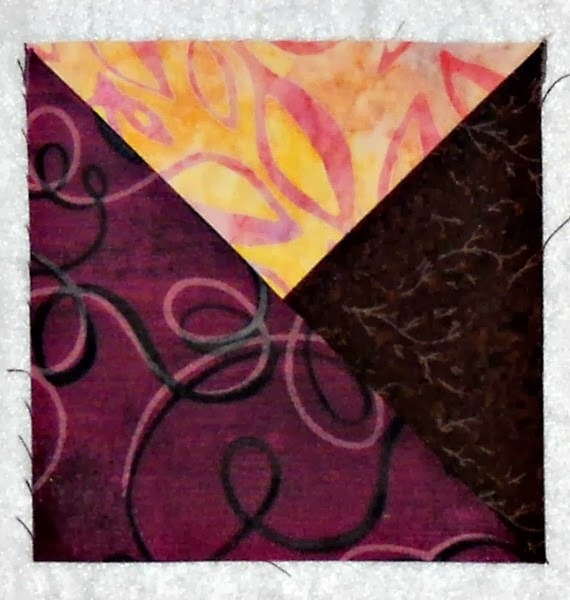 The Purple 4-1/2" square C should be in the center of the block. Sew the three rows together to complete your block. Smile!